Credit cards for fair credit include a variety of options including cards that offer rewards like cash back and bonus points. Finding the right card can help you continue to build your credit history and improve your credit score. 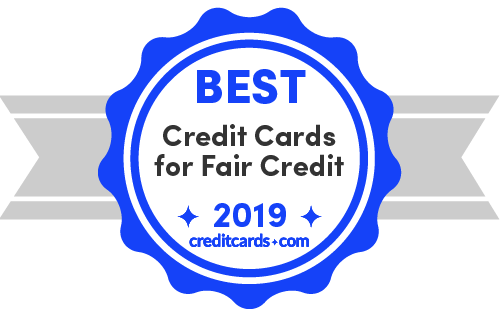 Here are our best credit cards for fair credit. Fair credit may not be the best of credit, but there’s hope. With the average VantageScore at 675, that’s right in the middle of what the scoring model deems fair or what is sometimes called average. With fair credit, you can build your score, earn some rewards and develop good financial habits. Is a fair credit score good? How fast can credit improve? Not sure what to expect? We’ll share how to build credit and how to maximize your fair credit card. The two major credit scores in the United States are provided by FICO and VantageScore. FICO is the creator of the first, and still most-widely used score. Both scores range from 300 to 850. Each defines “fair” credit slightly differently. You may be surprised to learn that your marital status and age don't impact your credit score, and you're not alone if you thought that. VantageScore and the Consumer Federation of America found in a poll they commissioned in June that about two-fifths of consumers wrongly believe that marital status and age affect their scores, and the misunderstanding is even higher with other events. Payment history: 35 percent – If you make a payment 30 days past the due date or later, it will most likely appear on your credit report. The later the payment, the worse the impact on your credit score. Amounts owed: 30 percent – The less available credit you are using, the higher your credit score will be. Length of credit history: 15 percent – This refers to the average account age of your accounts and the age of your newest account, which gets younger each time you open a new account. New credit: 10 percent – Each time you apply for a new credit card or loan, a hard inquiry will hit your credit. Credit mix: 10 percent – Having several types of loans – such as a car loan, a mortgage and a credit card – can help your credit. As this shows, the most important things you can do to improve your credit are making payments on time and making payments in full. To view your current credit score for free and without impacting your score, check out our app. Simply put: No. In the FICO score, it is a below-average score. Since credit offers are based on creditworthiness, people with fair credit get below-average offers. But if you have fair credit, all hope is not lost. While lenders typically prefer credit scores to fall in the good to excellent range, people with fair credit scores are still considered viable applicants for many loans. Additionally, with some work, persistence and responsible credit usage, you can improve your credit score. Common ways that consumers improve their credit ratings are by contacting the major credit bureaus (Experian, Equifax and TransUnion) and asking them to remove reporting errors, paying down credit card balances and paying off accounts that have been placed in collections. Another tactic is to ask for an increased credit limit on your credit cards. For people who carry credit card balances, an increased credit limit lowers the credit-to-debt ratio, a key factor in credit scoring. Although credit scores can be improved in a few weeks, most improvements take months and some take years. It may take some time before you qualify for the very best credit card offers, but there are plenty of good options for fair credit in the meantime. By increasing your credit score, you will have access to better financial opportunities, such as lower interest rates and better credit card offers. To see what credit card offers are available to you, check out our CardMatch tool or review our list of fair credit cards and cards for those with no credit history. What do I do if I'm rejected for a credit card? If your hopes of landing a credit card of your dreams have been dashed, we can help. By taking the right steps, you can recover and get the card you want and need. Issuers are required to explain to you why you were rejected. You might find out online, by phone or by mail – no matter which way, read the issuer's feedback, then rectify the situation. In general, it's a good idea to check your credit reports several times a year. You can check them for free once a year at AnnualCreditReport.com. If you've been rejected by a card issuer, make a point of checking your credit files to make sure there are no errors or omissions. If your credit files are too weak for even a basic secured card, talk to your local credit union about getting a credit-builder loan. These loans are designed for improving your credit rather than getting money for a home improvement or car. Pay all of your bills on time, even your library charges, and pay down any debt you have. Your more recent activity weighs more heavily, so those on-time payments are priceless. If you already have cards, don't close them. Instead pay them down and keep using them. Why? Because your payment history remains on your credit files for several years, good or bad, so you aren't protecting your credit just by closing the account. In fact, the available credit on your cards helps your file, as does continuing to pay on time. Wait several months before applying for a card again. Too many card applications too close together can mean desperation to a lender. Also, this gives your score a chance to improve. In this case, don't reach for the stars. Instead, choose a card to apply for that you are pretty sure you can get. If you are unable to qualify for an unsecured card, try a secured card to help build your credit. You may have dreams of getting a nice fat credit line with that new credit card, but if your credit isn't its best, you might be unpleasantly surprised. The averages for new lines of credit are typically lower than all lines, with super prime new accounts at $10,300, prime at $5,653 and subprime at $2,672. These figures are from the American Bankers Association's Q3 2018 Credit Card Monitor. While the averages for credit lines for all credit cards have basically remained unchanged for super prime credit, they have increased somewhat for consumers with prime and subprime credit. Here are the figures for lines of credit for all credit cards. Mortgage rates are usually 0.5 to 0.75 percentage points higher for a 30-year fixed-rate loan. Auto loans are typically 4 to 7 percentage points higher. Credit card interest rates are often 5 to 7 percentage points higher. Unsecured personal loans can be about 7 percentage points higher. The length of time it takes to improve your credit depends on the details of your financial situation. Along with your credit behavior, your starting score is a major factor. For example, if you have no credit history, it will take a minimum of six months to establish a credit score. Credit score formulas require an active credit account to be present for at least six months before a score is generated. If you are repairing damaged credit, however, it can take much longer to up your score. A person who only qualifies for a secured card, for example, can generally improve to fair credit within 12 to 18 months – with responsible card usage, of course. Regularly check your credit files for mistakes, such as payments marked late that you paid on time or negative information that's too old to report. Notify the credit bureaus of any errors you find, no matter how small, because even a little one can be a sign that you're a victim of fraud. Credit bureaus are required to respond to credit disputes within 30 business days. Resist the urge to apply for several credit cards at once. Each application, whether you get the card or not, dings your credit a little, about 5-15 points each. Instead, choose a card that you are reasonably sure you qualify for and apply. This is the single most important credit-building habit you can have. With every on-time payment, you are building your credit that much more quickly. The second most important part of credit building is maintaining low balances, or a low utilization ratio. You want your ratio, which is how much you owe by how much you have available, to be as close to 0% as possible. Already knee-deep in card debt? Pay down cards with the highest utilization first. Because credit card issuers usually report to the bureaus each month, it shouldn't take long for your score to reflect a lower balance. People with fair credit tend to have cards with low credit limits. To keep your balances low and avoid increasing your credit utilization ratio, making small, multiple payments throughout the month. Payment history has the biggest impact on your credit score. If you are behind on any bills, you should call the creditor and arrange to pay the past due amounts. After making your payments, you can request that the creditor rescind any reported delinquencies so they that will no longer show up on your credit report. While this may be the slowest step, it is essential to improving your credit score. Use your card to build credit. The most important aspect of using a card that requires fair or average credit is that you can build your credit with it, which will grant you access to better lending products. Keep your utilization ratio low. By keeping your card balance low, you keep your utilization ratio low, which is your balance by your available credit. Look for a card without an annual fee. By taking out a card with no annual fee, you minimize the costs incurred with card membership. Practice with rewards. Cards for fair or average cards will sometimes have rewards, such as 1 percent back on all purchases. This is a good way to practice for getting a rewards card down the road. Make sure you don’t carry a balance, because interest charges will negate your rewards. Don’t close your old card. Once your credit score has risen to the point that you can apply for a better card, don’t close or stop using your card for fair credit. By continuing to use it, as least for small charges, you keep the account active, continuing to build credit with it, and you increase your available credit.